Satisfy your appetite for lunch or dinner at the aparthotel's restaurant, or stay in and take advantage of the room service (during limited hours). Wrap up your day with a drink at the bar/lounge. Full breakfasts are available daily from 8 AM to 10 AM for a fee. Make yourself at home in one of the 60 air-conditioned rooms featuring minibars and LCD televisions. Rooms have private balconies. Satellite television is provided for your entertainment. Private bathrooms have deep soaking bathtubs and complimentary toiletries. Make yourself at home in one of the 84 air-conditioned rooms featuring minibars and LCD televisions. Rooms have private furnished balconies. Complimentary wireless Internet access keeps you connected, and satellite programming is available for your entertainment. Private bathrooms with showers feature complimentary toiletries and hair dryers. Set in a great location on Cleopatra's Beach in central Alanya with views of the castle set high on a hilltop, this hotel is a great base for beach lovers and those who wish to be within easy reach of the resort's many amenities. The pedestrianized shopping centre is approximately a 10-minute walk and public transport runs close to the hotel. The hotel features a pleasant pool area with a cafe terrace leading onto the beach. There is also a sauna and Turkish bath for guest leisure, and guests will find drinks and snacks at the three bars and rich and varied buffet-style meals at the in-house restaurant. With a stay at Palmiye Beach Hotel, you'll be centrally located in Alanya, steps from Kleopatra Beach and within a 10-minute walk of Alanya Aquapark. 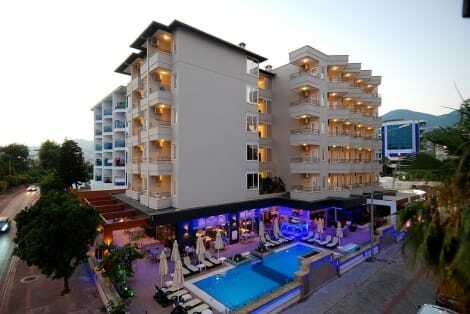 This beach hotel is 0.6 mi (1 km) from Damlatas Caves and 1.5 mi (2.4 km) from Alanya Gardens.